Home > Ask Our Experts > Moorings Business: Do I Need a Licence to Live There Permanently? We own a small moorings business which has been established for at least 20 years. We also have our own boat on there which we are thinking of living on permanently. Do we need extra permission to do this from the relevant water authority or council as it is already a recognised moorings and we pay council tax. If you are already in possession of a long-term private licence for your vessel – and if your “own boat” is already in official service then I would guess that you are – then you don’t require any further permission to use your boat as your permanent residence. If you use a boat on the rivers and canals of England and Wales that are under the jurisdiction of British Waterways then regardless of whether you use it for intermittent trips or as a permanent residence, you require the same ‘Standard Boat Licence’. You would only require a different licence if you were planning on living in a static houseboat that is not used for navigation. This is known as a ‘Houseboat Certificate’. Costing the same as a mobile canal and river licence, this is required in preference to the Standard Licence. If your mooring is in an area overseen by the Environment Agency or the Broads Authority then you would need their own equivalent private licence. When most people first consider the idea of living on a boat they are typically faced with two major headaches. Firstly, securing a decent permanent residential mooring can be an arduous task, as spots are at a premium, particularly in the south-east of England. The costs that they often demand can also add a significant expense dent to any naive plans of a cheap new waterborne existence. 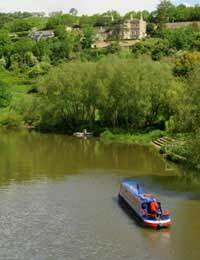 Secondly, further expense is required in order to pay for an annual licence to utilise the waterways of Britain. However, not only that but in order to even qualify for licence, you must first ensure that the vessel meets the necessary safety standards, by securing a Boat Safety Certificate - the equivalent of a MOT for a motor vehicle. By law the vessel must also must be protected with third-party insurance. However, in owning both a recognised mooring and a boat that is already in active service, these key issues for those considering a new life on the water are no concern of yours. The only other concern you would have when adopting a boat as your main residence would be that you would then be liable for council tax (payable at Band A, the lowest band), but as you are already paying this that is no worry for you either. As matters stand at the moment you can move into your new home without any worry about having to ask anyone's permission. I have 14 available moorings at a property I have just taken over in Bedfordshire, where can I advertise them to rent?